Home >> Prof. Development >> Want to See the World? Teach Overseas! Want to get away from the daily grind? Can you imagine living in an exotic place you've read about in books? For recent graduates -- and seasoned educators -- teaching abroad can be the adventure of a lifetime. A myriad of jobs -- in a myriad of places -- are as close as a mouse click away. Included: Web resources to help you locate that perfect overseas job! Have you ever fantasized about teaching in another country -- taking a total break from routine to experience a new culture? If you are a recent graduate, does the idea of traveling before you settle down have appeal? Every year, thousands of teachers and recent graduates leave home for adventure in places they might know about only secondhand. Why is now is the perfect time to take off on such an adventure? Think about the Internet. About 80 percent of Internet content is written in English. Countries that want to be competitive hire English-speaking workers. Leaders in China, Indonesia, and South Korea all speak English fluently. Hong Kong plans to spend $6 million next year to subsidize English-language classes. In Japan, a special government panel suggested that the country adopt English as an official second language. Nova, a Japanese company that teaches English, is expanding from 75 outlets to 390 within the year. Throughout Asia and Europe, millions of people are scrambling to learn English. Many countries do not have enough English teachers, so they assiduously recruit native English speakers, offering them free transportation, subsidized housing, and more-than decent wages. Between housing benefits, tuition-free school enrollment for children, and good salaries -- tax-free everywhere but in western Europe -- most overseas teachers can expect to save from $5,000 to $45,000 annually, according to The International Educator, the official publication of the International Educator's Institute. Frequently, salaries in the Far East are highest; they approach $100,000 in Japan. Salaries in the Middle East follow. WANT TO TEACH IN JAPAN? After he graduated from the University of Virginia, Jean-Francois Mannina planned to work abroad. He applied to a variety of programs. Although he spoke no Japanese, he was offered a contract with the Japan Exchange Teacher (JET) Program. He also won a Fulbright Program teaching scholarship to France. Mannina liked the JET program's support system and the fact that JET recruits people from all around the world; he would meet and interact with a variety of people from many backgrounds. Mannina was surprised at the difficulty Japanese people had speaking English, despite studying it for six years in secondary education programs. He found that even many Japanese teachers of English had difficulties. In the past, Japanese schools had emphasized grammar, reading, and writing, not oral expression, he told Education World. "The need is great for native speakers." JET participant Sarah Roos didn't know Japanese either. She felt no books could have adequately prepared her for Japan, however. Although she felt lonely at times, her loneliness eased as she learned to live with people she didn't know well. "It's a completely different culture," Roos told Education World, "but I wouldn't trade that experience for the world." JET participants are never alone in the classroom, Nancy Canada told Education World. Canada is a Japanese Consulate JET coordinator and herself a JET alum. Because JET participants are assistants to primary teachers, knowledge of Japanese is not a requirement. What is required, though, is that participants have a bachelor's degree and be younger than 35. Contracts are for one year, renewable twice. The program covers all travel expenses. Housing arrangements may vary, but some cities or prefectures (states) to which participants are assigned provide free furnished housing. The salary is a respectable sum for living in Japan and enjoying what the country has to offer, said Mannina. What's more, it is all tax free! Bill Jordan enjoyed teaching abroad so much, he participated in three different programs and then created WWTEACH, a Web site listing dozens of ways interested teachers can find overseas jobs. The first time he tried to find work overseas, Jordan told Education World, he sent out about 50 rsums but received only form letters suggesting he attend recruitment fairs. What helps when interviewing at those fairs, he said, is multiple certification or certification in need areas, a minimum of three years experience, and -- at least for the first experience -- the willingness to work in less-popular schools. "I have no set life plan," Jordan told Education World, "but I do have a passion for travel and adventure. One day, I hope to settle down and open a bed and breakfast. I will have a room with a decoration theme from each country I have been posted in -- including the Philippines, Norway, and Turkey -- so far." Want to work for an organization whose slogan is "The Toughest Job You'll Ever Love"? How about the Peace Corps? For those who think the Peace Corp is only for the young, read Ann Furr's story. Furr, at age 55, teaches English in Jordan. Most Peace Corps assignments require that an applicant have a college degree and be at least 18 years of age. Even if you're a grandparent -- or not far from it -- check out the Web site -- you can apply online if you want to! Is hesitancy to surrender tenure and a pension keeping you from teaching abroad? Currently employed elementary- through college-level teachers and administrators with a minimum of three years experience might consider the Fulbright Teacher and Administrative Exchange Program. Six-week programs are available for administrators, and teachers can apply for year-long programs. Openings exist in Europe, Africa, the Middle East, and the Americas. Most teachers swap positions with foreign peers. They take leaves of absence with pay and use their regular salaries to cover daily expenses, so host schools incur no additional costs. In some cases, teachers locate housing for each other; in others, the local institution provides it. Many countries subsidize participants' transportation. Some teachers who cannot swap assignments take leave without pay, and the U.S. State Department covers their salaries. Lisa Ray, director of the American Studies Center in Napoli, Italy, told Education World that her organization offers full-time as well as short-term, three-month contracts to English teachers with Teaching English as a Foreign Language (TEFL) or English as a Second Language (ESL) certification and some experience. To expedite getting a job, fill in all forms completely, leaving no sections unanswered; keep the initial letter of application short and to the point; and include only a brief one- or two-page rsum, advises Margaret Deelman of Search Associates. Search Associates is an international placement service for teaching interns and for teachers and administrators with a minimum of two years of experience. Candidates shouldn't worry about language, Deelman told Education World. Although knowing the language makes integrating into a local community easier, almost all international school teaching is done in English. This year, Search will host 11 job fairs and expects to place almost 700 teachers in international schools. If you'd like to teach abroad -- but only in a place where English is the predominant language -- check out the list of job announcement, updated weekly, offered by The Chronicle of Higher Learning. The majority of the jobs posted there are in the United States, but several are international. The free August 18 issue, for example, lists opportunities for teachers with and without doctoral degrees to teach in universities in Kuwait, Nigeria, and Botswana as well as Australia, Canada, and South Africa. There's also Teach NZ New Zealand's international teacher recruitment site. This site provides video clips, interviews, training information, scholarship information, and continuously updated vacancies to help teachers find that perfect position. Beware, however. Teaching abroad can be habit forming. Jean-Francois Mannina and Nancy Canada spent three years in Japan. Bill Jordan has had three overseas stints so far, and then there's Karen Dunmire. Although she originally planned to teach abroad for only a short while, Dunmire and her husband have been doing it now for more than 30 years! "I figured it was a good way to go on a two-year holiday in an interesting area," Diane Simmons Tomczak told Education World." I've been gone 12 years now and still love it." "I would recommend teaching abroad to any young teacher or to an older, more experienced one," adds Judith Rowlands. "It is quite different from working in one's own country. But you will understand what I mean only if you take the plunge." The University of Northern Iowa will host more than 100 American international schools from more than 65 countries at their Overseas Recruiting Fair this March, according to Tracey Roling, coordinator of overseas placement. The UNI event is the oldest of its kind in the world. People interested in attending should contact Roling's office for fair registration materials. TEFL Professional Network. The site offers job information, links to recruiters, and lots of free services for people with TEFL certification. The European Council of International Schools (ECIS) ECIS works with approximately 500 schools whose students range from three to 18 years of age. Instruction in most of the schools is in English. Most contracts are for two years. The ECIS service is free. U.S. State Department Overseas Schools This site links to American-sponsored international schools. It also includes travel advisories and advice on contracts and conditions in selected regions. For additional information on overseas programs, contact cultural offices at embassies and consulates. Check https://www.usembassy.gov/feed/ to find the Web page of the one closest to you. Department of Defense Education Activity (DoDEA) Check out this site for information on teaching in schools for dependents of military and civilian personnel stationed overseas. Friends of World Teaching For a small, one-time fee, find global positions through this site. Ed-u-link. Post your rsum or vacancy on this site. Prospective applicants can view available jobs by category, date, or location. Web66 Find home pages of schools around the world through this University of Minnesota College of Education and Human Development sponsored site. "Rough Translation: 'No English, No Job' -- A Reality Many of Asia's Workers Face" This July 21, 2000, USA Today article describes the need for English competency in many countries across the globe. Author! Author! 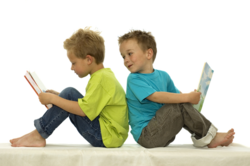 Activities for National Childrens Book Week!